EasyFold’s popularity has been on the rise and our customers often write glowing testimonies about the EasyFold wheelchair. However, we at EasyFold Canada are taught to believe that there is always room for improvement. We rarely get customer complaints but sometimes some customers require more interior space than the Elite and Standard models offer. We at EasyFold Canada pride ourselves in providing mobility independence to all, which literally means all, meaning all shapes and sizes, so we introduced a new EasyFold Elite Plus which is sleek, affordable and can now accommodate users up to 395 lbs! The EasyFold Elite Plus model has the exact same weight as the EasyFold Elite model. A redesigned frame allows the Elite Plus Model to carry more weight and it allows two more inches of seating room for users, all while still maintaining the same exterior dimensions of the normal Elite model. It easily folds down to a compact size so it can be stored at your home or transported in the back of a vehicle without the use of a ramp. Like all of our model it comes with a 3-Year warranty, Free Shipping and No Taxes! The Elite Plus comes with two removable LifePO4 Lithium-ion, 24V 6aH batteries and a maximum speed of 8 km/h. Once you sit on the EasyFold Elite Plus power wheelchair, you will know it is extremely durable and you will enjoy every minute of driving it. Your purchase includes everything you need to use it! 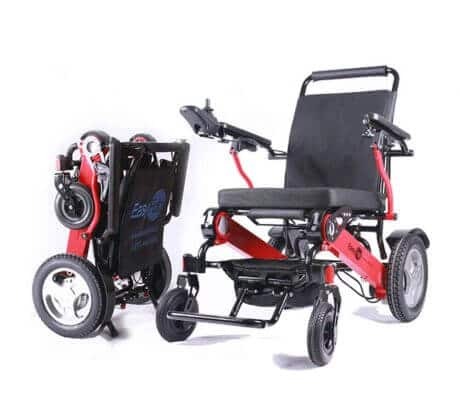 This entry was posted in Easyfold Elite Plus and tagged easyfold canada, easyfold electric wheelchair, easyfold elite plus, Easyfold London ontario, EasyFold wheelchair, EasyFold wheelchair travel, Elite plus wheelchair, portable power wheelchair, wheelchairs.